Preheat oven to 375 degrees F (190 degrees C). Position oven rack in the bottom third of the oven. In a medium bowl, toss together the sugar, flour and allspice. Sometimes instead of just allspice, I’ll use apple pie spices. Mix in the apples, cranberries, brandy (or apple cider) and vanilla. Place bottom crust into a 9 inch round pie pan so that it hangs 1 inch over the edge. Pour filling into the crust and cover with top crust. Seal and flute the edges. Cut slits in the top using a small knife or fork. Bake in the preheated oven for 60 to 65 minutes, or until apples are tender and crust is golden. Before baking, cover the edges of the crust with strips of foil to prevent them from over-browning or burning. Remove during the last 15 minutes of baking time to make sure the edges brown. Some recipes say to add the strips of foil during the baking time, but have you ever tried to cover the edges of a pie while it’s hot and steamy? I gave up on that method after too many unfortunate incidents of burned fingers and now do it before baking – the pie crust turns out evenly browned every time. You also want to put the pie on a cookie sheet while it bakes, in case it drips – I usually cover the rack below with foil…much faster/easier cleanup! That pie looks sooooo yummy. I am craving for one right now. I like most kinds of pie. Can you use the same recipe but put a different filling? 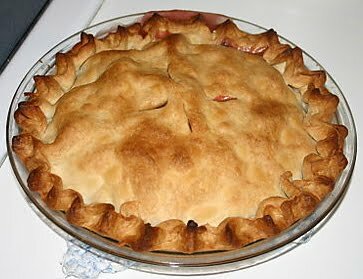 This Apple Cranberry Pie is perfect for any occasions.It was so yummy! I love eating pie’s 🙂 Baking is one of passion. I like pies – any kind of pie. Baking is the technique of prolonged cooking of food by dry heat acting by convection, and not by radiation, normally in an oven, but also in hot ashes, or on hot stones. Pies are really yummy desserts. I wish I can bake as good as you. That pie looks delicious. This is a wonderful twist on the traditional apple pie – great for fall! It calls for Pippin apples, but I usually use a combination of several kinds. I really enjoy taking down notes.Traditional apple pie ingredients that you gave is very useful. Cranberries are not just medicinal, they’re yummy too especially in pies. The pie you baked looks perfect. I like baking too. I always bake chocolate cake on birthdays but never tried baking pies yet. I might try one of these days but I still need to get some stuffs for baking pies that I might need like baking pans for pies. That apple cranberry pie looks delicious! I like it. Thanks for this recipe. My boys will enjoy eating this pie. hm, looks like a good idea. Thank you for the recipe!! 🙂 Will try it out tonight with my little ones! People all over the world are very innovative when it comes to apple pie. 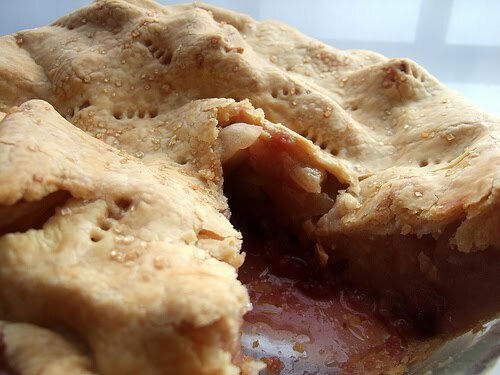 There are lots of apple pie recipes which humans love. The Dutch Apple Pie recipe from GeniusKitchen is one among the very popular due to its nutritious and scrumptious contents and tremendous toppings.